After you have killed an animal it is your responsibility to salvage all of the edible meat, in accordance with the Alaska regulations. You must salvage all of the edible meat for all big game animals except brown/grizzly bear, wolf and wolverine; see the regulations for an exception to this rule for black bears. Alaska's meat salvage regulations reflect the high value Alaskans place on game meat, ethical hunting and respectful treatment of game animals. Failure to salvage edible meat is a serious offense and penalties here are stiff. If no attempt is made to salvage meat, the minimum fine is $2,000 and 7 days in jail. The more egregious charge, of wanton waste, carries a maximum penalty of one year in jail and a $10,000 fine. Be aware that Alaska regulations state that the horn, hide, or antlers may be taken out of the field only after the meat is packed out. Hunters should know how to field dress and care for meat before going afield. Some hunters waste a lot of valuable meat because they simply do not know the how to properly field dress game. There are several good methods of field dressing. If you have never field dressed a moose or other large-bodied game animal you may wish view our video Field Care of Big Game instructional video. It will show you a step-by-step method to field dress a moose, no matter how or where the animal has fallen. You will be successful with any method as long as you remember these keys to meat care: Keep the meat cool, clean, and dry. Heat is the greatest threat to game meat. Rinse off any rumen, bile, or urine that gets on the meat. Also keep hair, leaves and tundra off of it as much as possible. The microorganisms that spoil meat multiply more rapidly in warm temperatures. To get the meat cool, remove the hide as quickly as possible and get the meat away from internal organs. The warmer the weather, the more urgent this becomes. Be sure to bring enough ropes and tarps to keep the meat out of the sun at all times. It may be appropriate on some hunts to schedule a mid-hunt check by an air taxi to pick up meat. Meat that spoils the quickest will be around the hip joint in the ham (rear leg). In weather over 60 degrees, it may be necessary to actually place the meat in cool water for 30 to 45 minutes to reduce the heat. A nearby creek, river, or lake will do the job. This is about the only time that game meat should be put into a plastic bag. As soon as possible after cooling, remove the meat from the plastic (if used), thoroughly dry the meat, and put it into cotton game bags. Resembling coarse pillow cases, good bags allow air to circulate to the meat but are tough enough to hold heavy loads. Avoid the bags that look like cheesecloth; they rip easily and allow flies to get on the meat to lay eggs. Bag all of your meat before you take your first load back to camp. 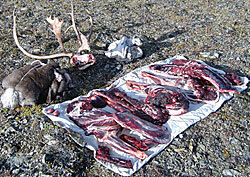 In order to reduce weight to be packed, some hunters "bone" the meat. That is, they remove all edible meat off the bones, legs, and spine. The problem with boning is that chunks of meat placed together in a game bag are harder to keep cool and clean. In some game management units in Alaska, it is illegal to bone the meat because of a local history of wasted meat. Back at camp hang the bagged meat off the ground to help keep the meat clean and cool. Hang it in a tree, on a rack, or in a small stand of alders. Your hanging area should be close enough to your camp that you can see it, but not so close that a bear could cause problems. Once all the meat is hung, remove the meat bags and spray the meat with a citric acid/water mixture. The meat should be sprayed until the mixture begins to run off the meat. About two ounces of citric acid for each quart of water will do the job. Food grade citric acid can be purchased at most pharmacies or feed stores. The citric acid will slow down bacteria growth that spoils meat, and it creates a dark "crust" on the outside of the meat that makes it harder for flies to lay their eggs on the meat. Don’t worry about the citric acid mixture getting the meat too wet. The mixture will dry quickly. Once meat is dry, reinsert it into meat bags. A tarp should be loosely placed over the meat pole to keep rain off the meat bags. The meat should be checked daily. The loose pieces of meat in the "hamburger" bag should be moved around each day to make sure they all keep cool and dry. Do not store game meat in plastic bags. If you are on a river float hunt, it is very difficult to keep the meat dry and cool when it is stacked inside the raft. Devise a rack to keep the meat off the wet floor. Then remove the meat from the raft every night before you make camp and hang it where it can stay cool and dry, with air circulating around it. Meat will usually keep for a week or more in the field if kept cool and dry. One popular method for transporting meat is to pack some of your gear in “wet-lock” boxes and then pack meat in them when you are ready to leave. You want a tough crust to form around the outside of the meat. This crust will keep bacteria out while the meat ages. During the aging process, the muscle proteins begin to break down, and the meat becomes more tender and flavorful. The length of time you age meat depends on the type of animal, the hanging temperature, and the humidity level. Hanging time ranges from one day to a couple weeks. When you finally get the meat into town, you can butcher it yourself, take it to a professional, or give it away (see below). If you decide to butcher it yourself, learn about meat cutting and storage before you get out your knives and freezer paper. Wrap the cuts well to avoid freezer-burn, and label each package to avoid the dilemma of "mystery meat." Game meat can last for several years in a good freezer if it is well-wrapped. To get the best out of your cuts of meat, plan on eating it within a year of when it was harvested. Experiment with recipes. When substituting game meat for beef or pork, remember that game meat is usually richer, leaner, and tastes its best when it is not overcooked. It is illegal to buy, sell or barter game meat. Unprocessed meat and other game parts may be transferred to others permanently (given as a gift) or may be transferred temporarily for the purpose of transport. However, two requirements apply: First, any meat you plan to give away must be in the same or better condition as meat you would keep for yourself. Second, you will need to fill out a "Transfer of Possession" form (see the back page of the hunting regulations book); keep a copy and give one to the recipient of the meat. You must show this statement and the meat to an ADF&G representative if asked. It is your responsibility to make sure that game has been legally taken before you accept or transport it. If you accept game or parts of game from someone else, either permanently as a gift or temporarily in order to transport that game, it becomes your responsibility to salvage all edible meat for human consumption. At least three formal Hunters for the Hungry programs exist in Alaska. Hunters who will be transporting game meat to Anchorage and other communities may contact Alaska Hunters Fighting Hunger at (907) 272-3663 (email: rbuchanan@foodbankofalaska.org). On the Kenai Peninsula, contact Kenai Peninsula Food Bank at (907) 262-3111 (email: foodhelp@ptialaska.net). In the Fairbanks area, contact Hunters for the Hungry at (907) 456-7267 or email sam@fairbanksfoodbank.org. Arrangements can also be made in some rural areas of the state (see Donating Meat in Kotzebue or the Villages).